The body, you can pinch your body so many places; it doesn’t hurt so much. But if you have a boil, you just touch it, it is painful. Have any of you ever had boils before? If you blow on it, it is painful; even if your glance touches it, it is painful, because there is a disease there. So it is painful. So Attachment is material disease, and it causes so much suffering. What are pains of attachment? We are always in fear of losing it, and even when we have it, we are always trying to somehow other sustain it. And it’s never enough! Therefore, Krishna tells in Gita. The real intelligence is – do not be attached to the sources of misery which are born of contact between the senses and their objects. Such pleasures have a beginning and an end; so the wise person does not really look for pleasure in them, because they bring about this attachment, and this attachment is like a fever which distracts our focus from the real purpose of life, which is to realize the self and its relationship with God. “Life is a flash. I was recently speaking with my father 81 years old and he told me, “Son! When I look back at my childhood, getting my first job, getting married, having three children, and I look at my whole life,” he said, “I am telling you honestly, it seems like it’s only five minutes.” Five minutes, 81 years! That is how fast life passes.” – Radhanath Swami. So Maharaj Parikshit, he asked this most relevant of all questions. “What is the duty of the man about to die?” And factually, every living being in this world is about to die, whether it is 80 years or whether it is five minutes. It’s not that much different. The fact is, death is approaching at every second. So what will be our regrets? What will be our frustrations? What will be our fears in life or in death? We must address that; that is real intelligence, and there is only one way to overcome. Dhruva Maharaj, he completely took shelter of Krishna. Therefore, when the residents of Vaikuntha came in the airplane to take him back to Godhead, death personified became the step which Dhruva had to step on with his foot to board the plane. It’s very symbolic. Because he took shelter of Krishna, death itself became a stepping stone for him to put his feet on to elevate him to Vaikuntha. So yes. For a devotee, death is just a step, that is a good step. Steps are facility to bring us upward, back home back to Godhead. So why should we fear?! Prabhupad tells about that prophet. He said about a Vaishnav, “Whether you live or die, it doesn’t really matter, because you are depending on Krishna, you are serving Krishna, you are chanting Krishna’s name. Now and after death, you will be doing the same thing.” He reasons ill who say that Vaishnavas die, when thou are still living in sound. Vaishnavas die to live, and live to spread the holy name around. That is our life. Our life is service. And service is eternal. It is the eternal nature of the soul. Jivera swaroop hay Kishnera nitya das. Lord Caitanya, the first teaching to Sanatan Goswami – very broad, expansive philosophy – he taught, but this is the beginning, that we are eternal servants of Krishna. The soul is eternal, Krishna is eternal and the connection between the soul and Krishna, devotional service, is eternal. This our attachment, this is our attraction: to hear about Krishna, to chant Krishna’s name and to remember Krishna. 31 Responses to "Nature of selfish attachments, and the way out"
Such amazing article on selfish attachment and very appropriate solution on it. If we attached to temporary things for temporary happiness better we should transfer our attachment to devotional service God which gives unlimited eternal bliss. Thank you very H.H. Radhanath Swami Maharaj for revealing wisdom. True. Thanks Radhanath Swami for enlightenment. Very true. Attachment leads to distress. Thanks Radhanath Swami for very relevant points. When the time of dereavation nears every sane person plunges into a plethora of thoughts and contemplation on his journey of life and how to face the termination of the same . swamiji rightly elaborates on this crucial incident each and everyone of us has to face for sure in the near future and what is the right thing to do at such times. Truly words of wisdom by Radhanath Swami. The nature of attachment is so nicely explained by Maharaj! And also the purpose of life! Excellent article!! Heart opening lecture by HH Radhanath Swami Maharaj. We have to understand the above knowledge explained. If we understand and apply we would be greatly benefitted. This is a nice article to understand what is attachment and how to get detached. This is very educative and helpful for all spiritual seekers. Its real intelligence and way for happy life also!!!!!!!!!!!!!!! Swamiji is revealing the bitter truth of this material world……thanks for posting. Thank you Radhanath Swami. You have diagnosed the disease and also given the medicine, in this crisp article. Thank you very much. And easy to relate as well. We all suffered from boils at some point of time or other. When I was small, I frequently would get them. Very painful. Because of such experiences, the thought of rebirth and becoming a child again is very scary for me. Attachment to the body always leads to suffering, because the body is temporary. 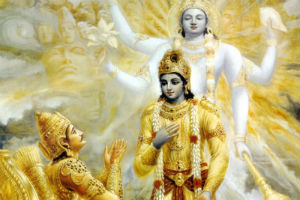 The Bhagavad Gita begins with Krishna imparting lessons on the temporariness of the body. That knowledge is critical to get rid of unnecessary suffering and lamentation. I have learned that we are servant and we need to serve someone..As said by HH Radhanath Swami in this lecture, but most of us chose to serve our senses, serve government, serve our boss at office, seve society or ever serve our family members without conception of service to God. Such services leads us to attachment to family, society, nation or religion. All this is superficial because death is going to take away everything from us. Than why should not attach our self for devotional service which is eternal and even death will help you to take it further. Raju Pr, You are a true saint. You are taking such nice care of you family, bringing up your childrens in a very God conscious environment. and catering to all their needs. Doing all the responsibilities, without any tendency to enjoy them – But with an attitude of service to Lord is much more that mere renunciation. Amazing lecture! True, attachment to material things always gives us misery because we are scared of losing it and try very hard to retain it. But due to the influence of time, it will go away one day and then we are left crying. So it’s better to be attached to the eternal – that which is always there – i.e. Krishna and service unto him. this will give us ultimate happiness and bliss.